I found something that makes me absolutely giddy yesterday! But let’s not begin there. First off, I finished Syrie James’ The Lost Memoirs of Jane Austen last week and I really enjoyed it! I’ve never been a fan of those books that continue Jane Austen’s novels and stories, but this was different and highly readable. It was exciting to read what may have been and it was nice to imagine that Austen had a passionate love affair that inspired the emotion in her novels (who knows? It really could be true). I’m currently reading Pride and Prejudice again (after reading James’ book I was in serious need of a Jane Austen fix) and am still reading Elizabeth Waterston’s book whenever the mood strikes. I also picked up a copy of After Green Gables: L.M. Montgomery’s Letter to Ephraim Weber, 1916-1941 by Hildi Froese Tiessen and Paul Gerard Tiessen on Saturday ($4.99 at BMV!) and have been thumbing through that. Why do I persist on reading three or more books at a time?! It’s baffling and I always feel like I’m not making good enough progress through them. Oh well, at least there’s always something around that I want to read when certain moods strike. Alex and I rented a few movies this weekend and I must say that all of them kept my attention. On Friday night we watched Tropic Thunder; I thought it was really funny and the way that they filmed some of the scenes (especially the ones where they were trying to make it look like a serious movie) were beautiful. I love Ben Stiller and Jack Black and Jay Beruchel (who I’ve adored since I first saw him on Numb3rs; and he’s Canadian!) but Robert Downey Jr. totally stole the movie; he was amazing and hilarious! Yesterday, we rented Enchanted and Slumdog Millionaire. Enchanted was tons of fun (Disney will always be in my heart); I loved the concept and all of the songs. Even Alex was smiling and laughing through the “That’s How You Know” number in Central Park. I most enjoyed trying to figure out which scenes were based on scenes from Disney animated classics. We watched Slumdog Millionaire last night and it was really well-done. There were definitely some really painful moments, but the whole thing was just superb (story, filming, acting, etc). I don’t want to give anything away as many people may not have had the opportunity to see it yet, but just one last thing: I loved the closing Bollywood dance number! On Saturday, when Alex was out having dinner with some friends, I watched Penelope again! It is one of my favourite movies and I would really recommend it to everyone. The story is so great, and the colour and creativity of the whole thing are amazing! I want to see if I can find someone in Toronto who will put the dust jacket into a Mylar cover for me. I’m a little scared to do it myself since there are little pieces trying to come off. It was really hard to take pictures of the cover and frontispiece since the background of both pictures is silver and the flash kept glaring; it wasn’t working out so well when I tried to do it without the flash (and my hands kept shaking too). 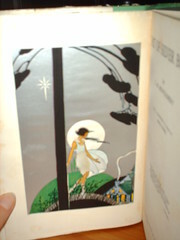 Maybe I should take some pictures of my 1917 Anne of Avonlea to share with everyone; that could be fun! I’m just waiting for my shipment of fabric to come from Quilt Home, hopefully it will arrive tonight and then I can share some pictures of that too (oh, and my butterflies from Lolly)! Nothing much more to say really other than that I hope everyone is having a great Monday (even though it is gross, gray, and rainy here). I will be spending the evening with my bestest friend Evan, watching some America’s Next Top Model and eating Chinese (because I am no model)! They're a bit behind in posting, but there are some cool bookshelves to check out. Thanks for your comment on my blog, I'll be checking back to see which gadget you choose! WOW! 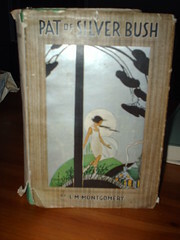 That must have been amazing... Pat of Silver Bush, that is a gorgeous copy! Who is its publisher? I am going to try and order one!